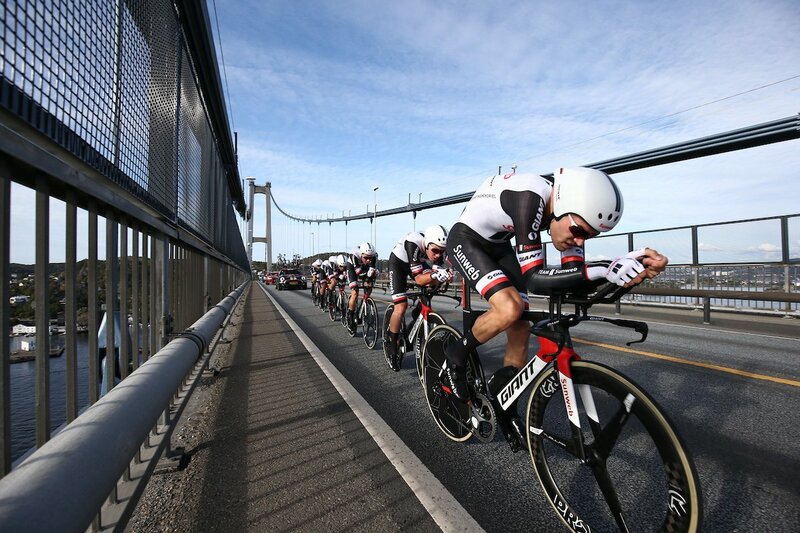 Live coverage of the men's TTT at the World Championships in Bergen. Hello there and welcome to our live coverage of the elite men's TTT at the World Championships. Sunweb just won the women's event - could they do the double? The big hitters are out today - Quick-Step, BMC, Sky, and Orica-Scott are expected to be among the medals on what is a really testing 42.5km course. The women's race was great entertainment - buckle up for more of the same. Local Norwegian team Fixit.no will be the first team down the ramp at 15:40 local time (around 20 minutes from now). The teams will set off in three minute intervals all the way down to last year's champions, Quick-Step. As far as TT courses go, it's a stunner. This is Boels Dolmans in the women's race earlier. The course for the men's race is the same as the women's, and we saw there that the Birkelundsbakken after 30km is pivotal. There are gradients well into the double digits, and the teams will have a hard time staying together. Since the Worlds TTT became a trade team event in 2012, it has been dominated by Quick-Step and BMC, with three wins for the former and two for the latter. They will both surely be in the mix again, having been one-two at the recent Vuelta TTT, but everyone's talking about Sky. The British team won bronze in 2013 but this time they have what is, on paper, up there with the strongest squads, especially for a hilly course such as this. The BMC coach on Sky: "Their line-up is monstrous." Full story here. Right, here we go. Team Fixit.no are on the ramp. Another Norwegian team on the ramp, with a full line-up of Norwegians. It's Team Sparenbanken Sor. Both teams have settled into a nice pattern, but this course is going to stretch these teams - all the teams - to breaking point. Next off the ramp is the Uno - X Hydrogen Development Team. Fixit are barrelling down one of the gentle downhill sections on this rolling course and they're on their way to the first checkpoint, which comes after 10.5km. Now for the Joker team, who developed Edvald Boasson Hagen. Kristoffer Halvorsen, the U23 road race champion who's on his way to Team Sky, in their line-up. Fixit hit the first checkpoint with a time of 13:11. Now we step up a rank, with CCC Sprandi Polkowice, the only Pro Continental team here. Their powerhouse is Marcin Bialoblocki. Now for the WorldTour teams. First up are Astana. Uno-X are fastest so far at the first checkpoint, five seconds quicker than Sparenbanken and 25 seconds quicker than that time set by Fixit. LottoNL-Jumbo roll down the ramp with a really strong team. Boom, Campenaerts, and Roglic all finished in the top five at the recent Tour of Britain time trial, while Jos Van Emden won the final-day TT at the Giro in May. Katusha now, and they have the individual time trial world champion Tony Martin as their leading light. Terrible start for Katusha as Machado has some sort of mechanical problem. Not sure exactly what it is, but he's back on the end of the train. Joker take 14 seconds out of Uno-X at the first checkpoint. No Sagan, but Bora-Hansgrohe get their ride underway. CCC take 26 seconds out of Joker. That's a fast first split. Movistar are off. Castroviejo and Dowsett are two powerhouses for them. Dowsett can't climb well so it'll be interesting to see if he works early on and is left behind for the climb. Here's Trek-Segafredo, the next down the ramp. LottoNL knock 11:52 out of CCC at the first checkpoint. Astana are also through but they're already 22 seconds down. Sunweb are off now. Will they be inspired by their women's team to a famous double? It's certainly a strong team. Team Sky, many's favourites for the title, are on the ramp. Here's their 'monstruous' line-up. Katusha and Bora are through the first checkpoint but aren't troubling LottNL - both around 15 seconds down. Fixit hit the climb and the double-digit gradients see them drop down to five riders. All five are together, though, as they come over the top, clocking 40:41 at the second checkpoint. Orica-Scott aren't really a TTT team anymore but they've still got strong riders for this event along with medal experience. And now for BMC, two-time world champions. Manuel Quinziato was meant to be in their line-up but admitted he's not in good enough shape and handed his place to Tejay Van Garderen. Movistar look good early on, four seconds down on LottNL at the first split. Trek not so much - 20 seconds down. And now for our final team on the ramp. It's the 2016 champions, three-time champions, Quick-Step Floors. A strong team, as always. Sunweb quickest at the first check! 5 seconds quicker than LottoNL. And, after a panicked last-minute bike adjustment for Bauer, Quick-Step are off, meaning that all the riders are out on the course. On the climb it's Sangemini who have made up some ground and gone quicker than Uno-X, Fixit and Sprebanken. 40:09 the benchmark. Wow, what a start from Team Sky. They're fastest so far at the first checkpoint, putting 10 seconds into Sunweb and 16 into LottoNL. Joker are fastest now at the top of the climb, more than a minute faster than Sangemini. But here come CCC, and they've knocked a further 1:20 out of Joker's time. The Polish team is down to the bare minimum of four riders. Fixit come to the finish and stop the clock on 53:11.91. Orica-Scott hit the first checkpoint 13 seconds down on Sky. Third fastest so far but we await BMC and Quick-Step for a full picture. Astana aren't going too well as they struggle on the climb. They're 25 seconds down on CCC at the top. BMC hit the first checkpoint and they're provisionally in second place, 9 seconds down on Sky. LottoNL have dropped a rider as they hit the top of the climb with a clean five. They clock 37:23.77 at the checkpoint, going 8 seconds quicker than CCC. Uno-X finish their ride with the quickest time so far - 53:00. They're through the first checkpoint just 1.34 seconds down on Sky, so second quickest so far. Astana, Bora, and Katusha all can't match CCC at the checkpoint at the top of the climb (31km). LottoNL still with the fastest time there. And CCC cross the finish line, stopping the clock on 49:34.47 - that's 1:24 quicker than Joker. Movistar are down to five but those five are together on the climb. Dowsett is indeed the dropped rider. And they're 3 seconds quicker than LottoNL at the checkpoint! Astana cross the line with four riders, stopping the clock on 50:06.21 - 31 seconds down on CCC. Katusha are on the approach to the line with a full complement of six riders. You won't see that from many teams today. LottoNL-Jumbo take the hotseat. They finish their TTT with five riders and a time of 49:10.00 - 24 seconds up on CCC. Trek have five riders and look quite good on the climb, but they're more than a minute down on Movistar's benchmark. All six are still there as they power up the climb, led by Tom Dumoulin. They're a huge 55 seconds up on Movistar at the checkpoint. All six were there not long ago but now Katusha are splitting up and they cross the line in a fragmented four. 49:36.00 for them. Third as it stands. Thomas and Doull have been dropped on the climb. Thomas is trying to claw is way back on but he's yo-yo-ing. Froome is looking round. He wants to wait for Thomas. But Thomas can't match the pace, and they must forge on without him. Sky are now five seconds down on Sunweb! Bora head to the finish with four riders. They clock 49:45.52. Fourth place for now but not for long. Sky were hesitant on the climb as to whether to wait for Thomas. Will that prove costly? Orica are 32 seconds down on Sunweb as they hit the checkpoint at the top of the climb. Movistar are heading towards the finish and they're going to set the fastest time. Only just though! 49:09.65 - 0.35 seconds quicker than LottoNL. Sunweb are quickest at the third checkpoint (38km) as well - more than a minute up on Movistar. The two-time champions are down to five but those five all look super strong on the climb and they're 3 seconds up as they hit the checkpoint. Sky are losing time. They're 9 seconds down on Sunweb at the third checkpoint, with just 4km to go. Sunweb still have six riders. This could be key. 50:40.03 for Trek-Segafredo. Well out of the picture. Sunweb come into the finish now, sprinting with a bare four in the final few hundred metres. 47:50.42 - quickest by over a minute. Quick-Step are on the climb and down to four early on. It's a big ask for them, too, as they're 16 seconds down on BMC's quickest time at that checkpoint. Orica have faded here. They're 43 seconds down at the third checkpoint. Just a few km to go but they won't be on the podium. Sky are on the approach now, but they're not going to win this. Kwiatkowski leads them through the final bends and they drive for the line. 47:50.42 for Team Sky. Second place at the moment, 22 seconds down on Sunweb. BMC could be on their way to glory! At the third checkpoint they're four seconds up on Sunweb. They still have five for these final few kilometres. The Sunweb riders are on tenterhooks in the hoteseats, watching the screen. Michael Matthews is so nervous. Live timings suggest BMC are fading! BMC have lost those four seconds, it seems. Can they hang on? Orica hit the line with 48:53.63 - third at the moment. Quick-Step are out of gold medal contention, it seems. 25 seconds down on BMC's time at the third checkpoint. This is between BMC and Sunweb. It could be going to Sunweb as BMC struggle to stay together, one rider dangling off the back. BMC round the final bends, but it's not going to be enough, I don't think. They can't manage it! 47:58.71. That's 8 seconds down on Sunweb. Quick-Step are still out there but it's going to be Sunweb's title. Just like in the women's race, it's the final third of the course that does it for Sunweb. Perfectly paced. BMC were quicker at both the second and third checkpoints but in the final few kilometres the race was turned on its head. WOW. Double day! @TeamSunweb speechless! As with BMC there are gaps between the Quick-Step wheels on the run to the line. They're going to be off the podium for the first ever time. 48:25.62 for Quick-Step. Fourth place for them. "It's crazy. First the women, and now us. It's crazy. The team was so homogenous. It was absolutely amazing. Normally people would say I'm the best time triallist on paper but with this team...it was so smooth, it was crazy. "We had a very good pace and kept it all the way to the line. We tried to keep together especially on the long climb, and that just about worked out - barely. But we made it over, and we were all flying. I don't have words, it's really unexpected but it's really very nice. It's the team event of the year, and we pulled it off." For more photos, along with full results and a write-up, here's our race report. Here's Team Sky, who started out strong but lost their way on the climb. Here's Stephen Farrand's story on the reaction to Sunweb's victory in the women's race. We'll have more from the men's squad on the site shortly - they're about to do their winner's press conference. That's it from our live coverage today. What a start to the 2017 Worlds - time trials get a bad rep but that was dramatic racing in stunning scenery. And what a day for Sunweb - that'll be some party tonight. We'll back next week for live coverage of the individual time trial events. In the meantime we'll have all the fall-out from Sky, Quick-Step, BMC and others shortly on CN. Thanks for joining us today. Bye!